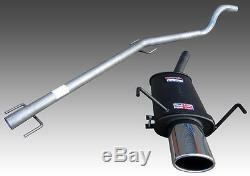 Astra Mk5 1.7 CDTi SRi SXi Sportex Exhaust plus Race Tube System - Oval. This well engineered SPORTEX performance exhaust rear silencer and'silencer-less' performance exhaust'Race Tube' section fits as a direct replacement for the original centre & rear silencers. It bolts directly to the exit of the Catalytic Converter on all Astra Mk5 1.7 CDTi 3 & 5 door SRi & SXi HATCH models built in the period June 2005 - Jan 2010. The SPORTEX Rear Silencer is manufactured from aluminised mild-steel and features a polished STAINLESS-STEEL Single OVAL tailpipe measuring 4.5" wide x 3" deep with an internally rolled tip. The Race tube is manufactured from high-grade aluminised mild-steel, and provides a deeper more hollow exhaust note. NOTE: This Race Tube is not manufactured by Sportex, and some 1.7 CDTi models do not have a centre silencer as standard. A performance improvement is achieved by improving the flow through the system. NOTE : THE IMAGE SHOWS THE ACTUAL ASTRA MK5 1.7 CDTi SPORTEX REAR SILENCER + RACE TUBE. Our hours of business are: Monday - Friday 9:30 to 17:30 Saturday Closed Sunday Closed. Don't forget to visit our. The item "Astra Mk5 Hatch 1.7 CDTi SRi SXi Sportex Exhaust plus Race Tube System Oval" is in sale since Friday, September 14, 2018. This item is in the category "Vehicle Parts & Accessories\Car Tuning & Styling\Performance Exhaust\Other Performance Exhausts". The seller is "on-lineautosport" and is located in Lichfield, Staffordshire United Kingdom.